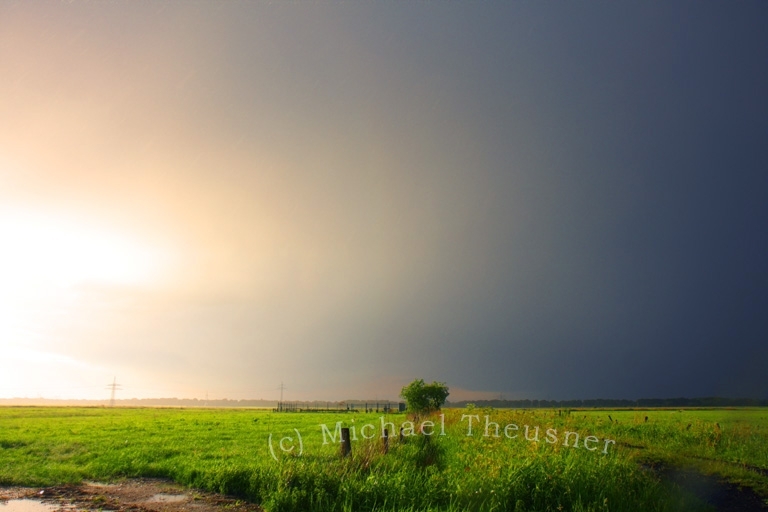 Last evening (11 June 2011) thunderstorms approached my home town Schiffdorf near Bremerhaven in Northern Germany. I went to a field road by car to take some photos of the storm clouds. Just after I had arrived (about 18:00 UTC), heavy rain started which lasted for nearly 20 minutes. To my disappointment, the rain covered the gust front and most of the interesting features of the storm. So I waited and hoped that the sun would come out soon and produce some nice rainbows. 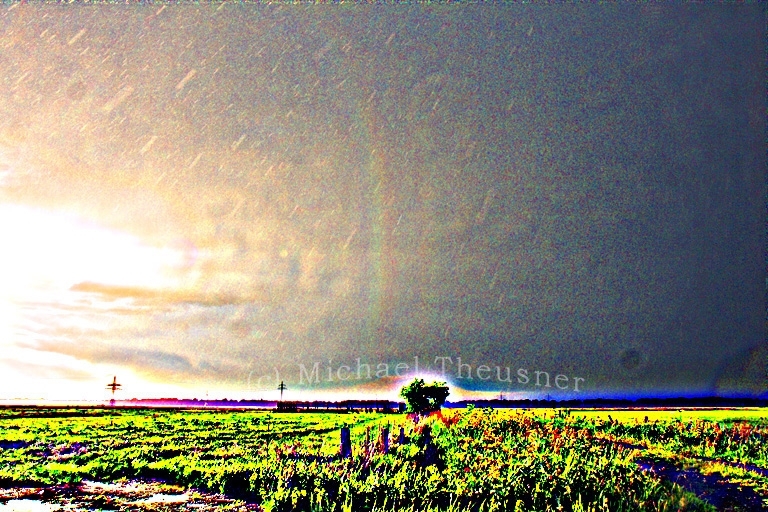 When it did I realized that the dark clouds covered the sky to the right of the Sun – just the situation Michael Großmann had had when he took the the first image of a 3rd order rainbow only four weeks ago. I decided to try this out as well. Instead of one image I took sequences of five to stack them and, thus, increase the signal-to-noise ratio. I hoped this would increase my chances to detect the 3rd order bow. I took the images from my car through the open window to protect my camera (Canon 40D) from the rain. Visually, I did not see a 3rd order rainbow. However, in my back, the 1st and 2nd order bow developed nicely. Back home I converted the raw images to 16-bit-Tiff and stacked them in Photoshop. Adjusting saturation already showed the 3rd order bow in the image sequences taken between 18:17 and 18:22 UTC (first image). Applying unsharp masking revealed something unexpected in one of the stacked images (from 18:19 UTC): There seemed to be another rainbow close to the 3rd order bow, but, with reversed colors (second image). I checked Les Cowley’s website and realized that my image likely showed the 4th order rainbow! After some more sophisticated processing including denoising (Neat Image), unsharp masking and increasing saturation, the 3rd and 4th order rainbows both were clearly visible. Finally, I created a composite using masks to retain the natural look of the foreground while still showing the 3rd and 4th order rainbows (third image). Posted on June 12, 2011, in observations, rainbow and fogbow and tagged high order bows, quartiary bow, rainbow, reflection, refraction, tertiary bow. Bookmark the permalink. 16 Comments. Hard to believe that soon after that former one here’s another wonder!!! Huge congratulation to Michael!!!! Congrats to both Michael’s. I have been thinking that the third is just theoretical curiosity and and even more so the fourth. Amazing captures! Superb. And so soon after the earlier capture of the tertiary. Great images, Michael!! Impressive 3rd and 4th rainbows observed under excellent conditions. and the 3rd-only earlier rainbow picture. I never seen a real picture of naturally rainbow higher order before. All known pictures are from handmade experiments. I’m a science journalist with Intermediair magazine, a Dutch weekly about career, work, politics, economics, science and technology (180 thousand readers, see http://www.intermediair.nl/magazine). I read about your first photo’s of a 3rd and 4th order rainbow, and I would love to use one of them for our weekly science image feature in the magazine, after a short interview with you, and providing proper credit. Of course extraordinary claims need extraordinary evidence. But these seemed convincing enough for me. They do not look like jpg artefacts or lens reflections. Of course, it would be nice to see an exacting simulation made in the same view of field as in the photos. The way we do with halo displays. 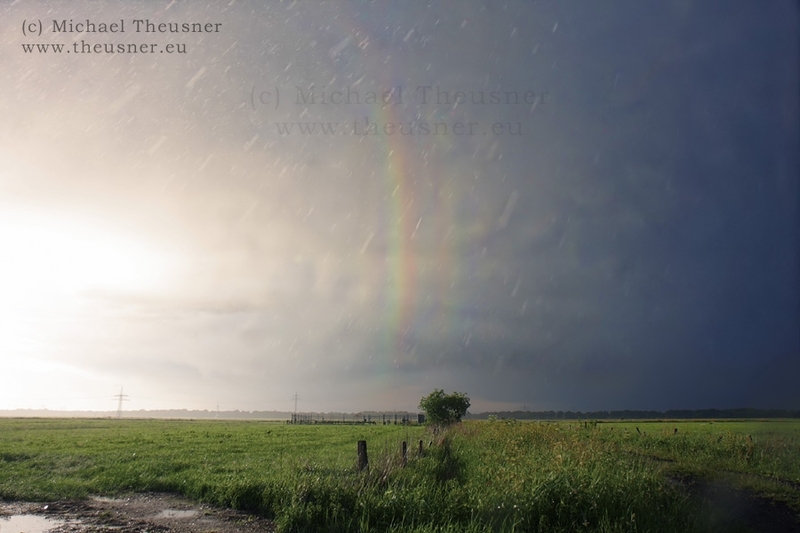 We know both Michael Theusner and Michael Großmann as expert and (self-)critical sky photographers, the latter haven often been featured in Spaceweather, EPOD and other blogs. Anyone who doubts these guys or wants to imply that there has been manipulations in their photographs, has a personal problem with enviousness. Nothing wrong with arising doubts. To get convinced, I prefer hard data, not stories about someone’s reputation. We have not seen any measurement or simulations, so this all is still resting on a shaky ground. i undertand your comment about the “shaky ground”. But in a few day i insert a pdf-file about the measuremants in my posting (naturaly tertiary 3rd order rainbow) and then i hope that the posting from me an Michael Theusner is credible. Michael G’s rainbow photograph has been registered with a starfield by rainbow expert A. Haußmann, and he determined the bow to exactly fit in between the angular range from 39 degrees to 42 degrees. The errors are well under 0,5 degrees. So, what else should be calculated or simulated now? Good luck for getting the first one in Finland! I seem to get in more doubt and it looks like you can’t get me convinced, Elmar. Guess it takes to get one myself before I find peace. You can take that with ISO 2000 film on a 35 mm camera. the US meterologist that said it was possible does not understand fully how they are created!!! was a myth and could not be verified.